A sprite sheet consists of multiple frames (also sprites) in one image. In other words, sprite sheets pack multiple sprites into a single picture. Using sprite sheet, you create sprite sheet animation representing one or several animation sequences while only loading a single file. Sprite sheet animation changes which frame/sprite is rendered in quick succession to give the illusion of movement. Step 1: Select an image element. Step 2: Click the Properties pane > Image section > Create Sprite Sheet. This opens the Define Sprite Tiles dialog where you can define frames/sprites. 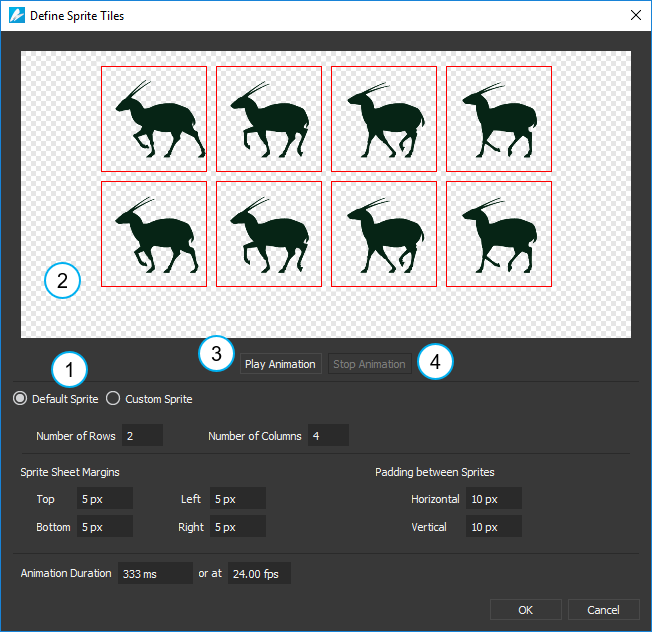 Select Default Sprite to generate frames automatically. Use this mode when your sprite sheet has uniform sized frames. Specifically, the frames are of equal dimensions and the padding between them is uniform. Select Custom Sprite to generate frames manually. Use this mode when your sprite sheet has non-uniform sized frames. Specify the Number of Rows and Number of Columns. Then, in the preview window (2), each frame is outlined by a red rectangle. 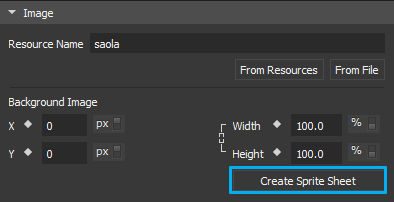 Specify the trimming options, including Sprite Sheet Margins and Padding between Sprites. Specify the Animation Duration of each frame in milliseconds or at FPS. By default, animation plays at 24 FPS. Click the Play Animation button (3) to preview animation in the preview window. Then, click the Stop Animation button (4) to pause the preview. Click OK to create frames. Click the Add Frame button (6) to add a frame. Immediately, a red frame rectangle (7) appears in the preview window. To define the frame size, either drag and resize the frame rectangle in the preview window or specify the frame’s position (X, Y) and size (Width, Height) in text boxes. Click the Remove Frame button (8) to remove a selected frame. Click the Play Animation button to preview animation in the preview window. Then, click the Stop Animation button to pause the preview. 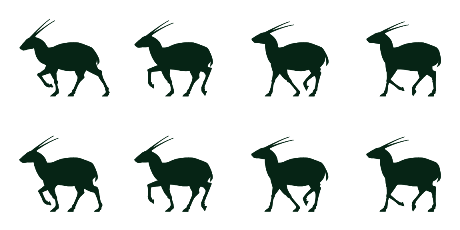 So you’ve learned the ways to create sprite sheet animation in Saola Animate. 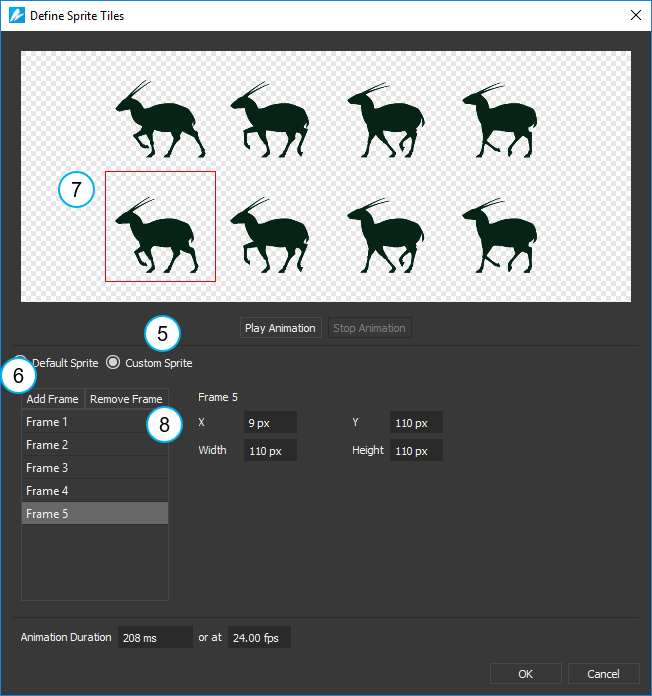 Try Saola Animate today to make stunning HTML5 animation and interactive content.